This weekend is the start of a new season. The off-season has been long. It has been seven months since the last NEO Endurance Series race at Road-Atlanta. 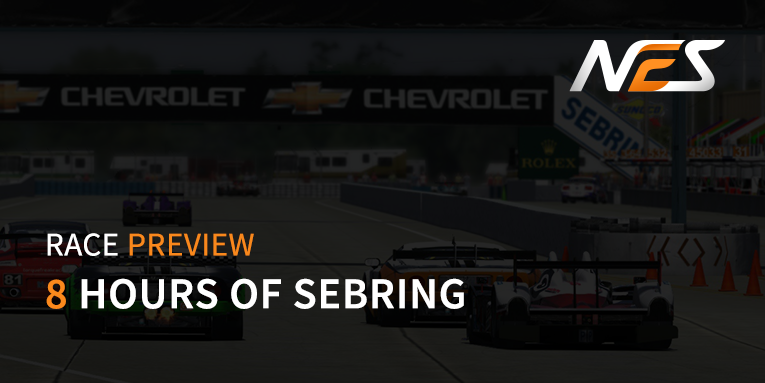 Luckily, the wait is over and it is time to fire up the engines again for the first round of the new season: NES 8 hours of Sebring. New this season is the longer race length of eight hours instead of six from last year. The two extra hours will bring more strategy calls, more action and more excitement to the opening race of the season. 184 drivers, spread out over 42 teams, are registered to compete this season. In all classes the teams are competitive. Expect a lot of battles throughout the whole field this race. The official entry list will give a detailed view of all teams and drivers. Co-founder Niel Hekkens made also for this season a spotter guide for the teams, broadcasters and the fans. Also this season RacespotTV will broadcast all races live, from start to finish. There are multiple ways to watch the race. As usual NEO has a live timing page with the stream, live timing and race updates. New for this season is that the races are also broadcasted on iRacing Live as well. 10:00 12:30 Warm-up 150 min. 12:30 13:00 Setting up the grid 30 min. 12:40 12:50 Drivers briefing 10 min.